Critical Ops APK 0.6.0 brings what first-person shooting game should look like. This game has simple rule for player. You can be either special forces for counter terrorism or terrorists them self. Yellow team represents terrorist and blue as Special Forces. As shooting game, it has three maps for battleground. You can plat in Barcelona, Tokyo, or Amsterdam to fight enemies. This game provides what player wants the most in shooting game. Player only receives simple order that is kill enemy. There is no complicated background or overwhelmed story. Basically, this game is purely shooting to clear the stage. At beginning, player has no money and use small pistol to join on mission. You can join others as team player or play individually. Money will be rewarded based on performance individually and team. It is fair game, so you will get money when perform well and vice versa. In stage two, player has enough money to buy new weapons such as riffle, shotgun, etc. This game relies purely on player’s skill. You still manage to kill enemy despite using pistol. Having rifle and shotgun does not mean improving shooting and killing ability. 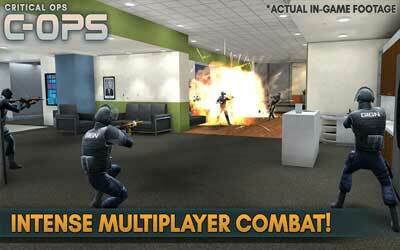 This game requires reflex and precise aim to shoot. It is the reason why this game is called classic shooting mode. Interesting part in this game is to make a group up to 20 players simultaneously. By using internet, you can choose to play as team with others and enhance opportunity to gain more money. Android is the major operating system in mobile device. Therefore, you might be easily to find other players. Your score will be displayed to show your skill. When you have good skill, the others will recruit to join mission or you need to make group on your own. This game is available for free. The graphic is great, particularly on three cities as battlefield. Critical Ops for Android is worth your game to kill the boring time.